When you join the amazing Paris whith incredible pieces it happens Maison et Objet 2018! Maison et Objet 2018 is here to leave a mark. For that reason we will show you some of the mid-century lighting pieces you can find there! Ready? You will love them, just like we do! Read more: Ella Suspension Lamp Is Our Vintage Beauty Queen! Here’s now time to talk about something you will enjoy, Vintage Pieces! However this ones will have a special detail, they will be at Maison et Objet 2018, the rightfull place where you can and will change your home, so prepare to empty your pockets but with a huge smile on your face. Let’s see then! Ike Suspension Lamp will be the first one we are going to talk about! This is the perfect lamp to have in any modern interior. With clean and clear lines, this dazzling lamp is handmade in brass and aluminum, it features a glossy black and gold plated finish, representing a high-quality craftsmanship, just like in every single lamp we are going to talk about in this article. Imagine the success it will have at Maison et Objet 2018! 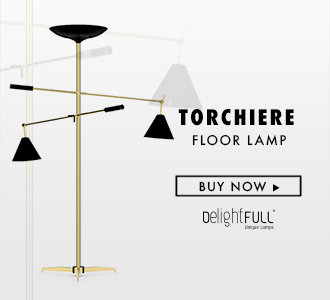 Now the incredible Coltrane Floor Lamp, the right example of the simpler, the better! This one can make a room, any room you choose, dining room, bedroom, living room, in any place he will be notice for everyone you know. It was inspired in John Coltrane, the famous American jazz saxophonist. Handmade in brass and aluminum, the minimal black floor lamp has a matte black finish on the three lamp shades with a gold powder paint on the inside, that provide a smooth lighting effect. Turner Floor Lamp is the true reflexion of Tina Turner, it’s inspiration. Why is that? Her movements, her energy is present in him. Tuner is a large table lamp handmade in brass and aluminum. The body has a gold plated finish, while the shade was lacquered a black matte on the outside and a gold powder paint on the inside. Just a versatile piece you can have in any room of your home. Last, but not least, one of the bestsellers at DelightFULL, Galliano Wall Lamp! Just like the others he is handmade by the most incredible and skilled artisans in Portugal. Made of iron with a matte black exterior and a gold powder paint interior finishing, Galliano produces a unique lighting effect when you see light being casted thought its pipes. See more: Shhhh It’s a Secret! The Pieces of DelightFULL You’ll See at Maison et Objet!